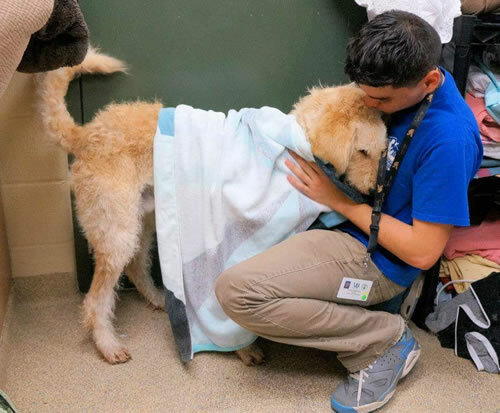 The volunteer program is intended to strengthen the relationship between the Sandusky County Dog Shelter and the public by creating an environment in which volunteers can interact with and positively influence the lives of sheltered dogs. The focus of the volunteer program is to increase community awareness of the duties of the Sandusky County Dog Shelter, increase community involvement with the Dog Shelter and promote responsible pet ownership. Walking dogs to provide socialization and improve behavior, mental health and decrese excess energy. Take photos of dogs and post them on the shelter's Petfinder and Facebook pages. Develop personality profiles for dogs and develop and circulate weekly adoption flyers. Bathe and provided limited grooming for dogs. Assist in maintaining the shelter cleanliness and appearance. Prospective volunteers shall be a minimum of 18 years of age to volunteer at the shelter. Prospective volunteers may be ineligible to volunteer if they have been criminally convicted for certain offenses under Chapter 959, Chapter 955 or other relevant chapters of the Ohio Revised Code. Eligibility is at the discretion of the Chief Dog Warden on a case by case basis. The Chief Dog Warden may disapprove any prospective volunteer for any lawful reason when the Chief Dog Warden determines such action is in the best interest of the Dog Shelter. Prospective volunteers shall read and complete the volunteer packet which is comprised of a volunteer application, volunteer agreement and release and waiver of liability agreement form. Upon completion of the volunteer packet, the prospective volunteer shall submit the three completed and signed forms to the Sandusky County Dog Shelter in person when they are ready to complete the volunteer orientation and training. Prospective volunteers need to complete the volunteer orientation & training before volunteering at the shelter. The orientation & training can be completed anytime during Sandusky County Dog Shelter hours provided an employee is available. Prospective volunteers are encouraged to call the shelter to schedule a date and time to complete the orientation and training with a shelter employee.